Cobra's Market View • View topic - We serve all the contents in mobile format too! We serve all the contents in mobile format too! We support mobile contents for this forum but you need a Tapatalk application (for $2.99) on your mobile device. See http://www.cobrasmarketview.com/2011/we ... tents-now/ for more details. Great news! Works with iPhone as described. Re: We serve all the contents in mobile format too! Santa must've known all I wanted for Christmas was mobile access to Cobra's site!! PoorHomey wrote: Santa must've known all I wanted for Christmas was mobile access to Cobra's site!! Thanks again for all the tips and screenshots. It's not Santa who heard you, it's you helped yourself to get this feature. And I think this would greatly increase the traffic to our site. Tapatalk allows me to set a twitter account, maybe I need set that in order to fix the twitter problem you reported? 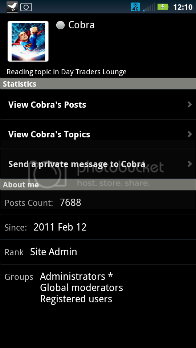 The easiest way to see only Cobra's posts from within Tapatalk is to click on his avatar to view his profile, then select "View Cobra's posts"
This will show you his posts only. Last edited by PoorHomey on Tue Dec 20, 2011 8:16 pm, edited 1 time in total. Could you login at http://www.cobrasmarketview.com with your mobile? Richarab seems cannot login. The login button is not for login he must hit "Enter" to login, but it seems he still couldn't login. Cobra wrote: Could you login at http://www.cobrasmarketview.com with your mobile? Richarab seems cannot login. The login button is not for login he must hit "Enter" to login, but it seems he still couldn't login. I just tested and was able to successfully log out / login via Mobile. Hopefully one of these methods will work..
2) Scoll to the very bottom of the page and select the option to toggle "Mobile theme"
3) Select "Ok" at the prompt to switch to "Regular View"
4) You should now see the standard PC-style layout - click "Login" in the upper right. ** Note ** If you select "Remember Me", you can then scroll to the bottom and re-enable the "Mobile Theme" and you should remain logged in. 2) Enter your username/password, and select "Remember me"
3) Scroll to the right side of page and click the "Log In" button. Right right right, I was paniced knowing Richarab cannot login (hey he is Rich Arab, come on, you don't want to make rich people unhappy). I should have thought about switching back to the normal theme. Thanks very much! OK, we have new mobile theme for the main site now. The login shouldn't be a problem anymore. The previous version was very confusing. Use the switch at the bottom to switch between the desktop theme and mobile theme. Here's what you need do to login. Also we now support iPad format too. Again you can use the switch at the bottom to switch between the desktop theme and the mobile theme.